In the April / May 1970 edition of the Suters House Journal there was a two and half page article by E.L. Grove, Lift Attendant, Uxbridge - Spotlight on Suters. As it has been difficult to reproduce this via scanning because of the bound book these are in it is reproduced below. In the beginning, long before the arrival of coinage as a means of exchange, the Ancients were even then traders, and used as a way to this end a system of barter, by which method business was conducted.Commodities embracing a variety of such things as salt, rice, tea, dates and cattle represented wealth to all nations in those far off days, that this system of exchange was discontinued. In the course of time the Bank Note made its appearance via the "Goldsmiths Notes", issued in the 17th Century as a receipt against coin or valuables on deposit with them. It is thus we have progressed to the 20th Century, and in this age it is possible for man, by the use of that ultra modern concept of debt disbursement, in the "Giro" system, to literally go through life without ever savouring the pleasant jingle of a coin in his pocket, or the rich satisfying crackle of a bank note in his wallet. A far cry indded from the times when man existed by exchanging produce from his land, or the beasts from his field. Trading has always been the life blood of man's existence, and centuries ago innocent savages gladly accepted glittering strings of beads in exchange for precious metals and priceless stones, while the slavers of old barted theirpitiful black cargoes of humanity for shiploads of grain or spices. This barbaric system of trading has now died a merciful death, and modern trading the world over is conducted on more humane lines, though throughout the ages a cut-throat competitive spirit has ever been prevelant. With the 20th Century came the dawn of a new concept in the art of presenting merchandise to shoppers the world over, and today we live in a world of streamlined supermarklets, trading stamps and super stores. The march of time has indeed outlawed forever the genteel deferential approach practised by our fathers, and the palmy days of cheap living also ended with the termination of the war to end all wars. The aftermath of World War II has been an upward trend in the cost of every saleable commodity, in its turn precipitating a worldwide war of wage claims and a never ending series of strikes that could threaten the economy of all nations by their maginitude. It is a small wonder that traders everywhere bow to the the invevitable, and in an attempt to move with the times, conform to modern methods of business. I am employed by Suters, a large Department Store situated at Uxbridge, some few miles from the Metropolis, and since my term of employment commenced I have winessed the departure of an old regime where discreet and deferential treatment to valued clientele was a universal practice. The growth and expansion of any concern must necessarily introduce a correspondingly larger number of customers, therefore an obvious inference is that protracked attention to individual customers is not practial or economically possible. The idea is sound only if the means are available to impement the teatment, and in these days of Selective Employment Tax and high wages, not to mention the difficulties in obtaining staff, its practice is limited. In the process of moving forward, therefore, it would seem that mankind has taken a rather large and ungainly retrograde step, for whom among us would not welcome a little of that individual deferential treatment showered on the cusomer of a bygone ag. As benefits an established family concern, Suters have always enjoyed a modicum of partiality from a discerning public, and the growth of the business can be more readily appreciated by a glance at available statistics from the early days until the present time, built up from its inception by sheer hard work and shrews administration. The initial venture was as far back as 1920, modest premises at Slough in Buckinghamshire. Came 1924 and the opening of a second unpretentious shop situated in Uxbridge and managed by two brothers, Mr. Clarence and Mr. Arthur Suter. From that time business increased to such an extent that by 1935/6 (at about the same period of King Edward's abdication), a new and very imposing building was opened to deal with an expanding trade and an ever increasing flow of customers. For so many years the Uxbridge branch had been managed by Mr. Frank Suter and on his retirement recently, new blood was infused by the appointment of a son, Mr. Michael, as the Store Manager. The advent of thisenergetic young man brought about swift changes to the face of Suters, and inovations, hitherto deemed not quite fitting to a decorous and tasteful astmosphere formerly an accepted part of the staid family business, began to make their prescence felt. The spacious building was subjected to the attentions of lighting experts, piped music was installed, a tannoy system enabling speedy communication was soon in operation, and a Boutique to capture the attention of a younger element was also opened recently, the attendance of a popular Disc Jockey drawing a capacity crowd to the store at the opening. Staff members were issued with identity badges, the red eyes of an ever-watchful camera winked down to combat the inclinations of the light fingered brigade, and schooling given to teach a more positive approach to the technique of selling. These latest departures from former methods are all part of a go-ahead policy geared to absorb the swiftly changing aspects of a modern buying public. Where before customers traversed thickly carpeted floors in sedate style, or used the lift to reach higher levels, today the bare wooden blocks resound to hurrying high heeled footsteps. A swiftly moving escalator provides effortless transportation to the regions above, while the switching round of a few depatments has completed the New Look. 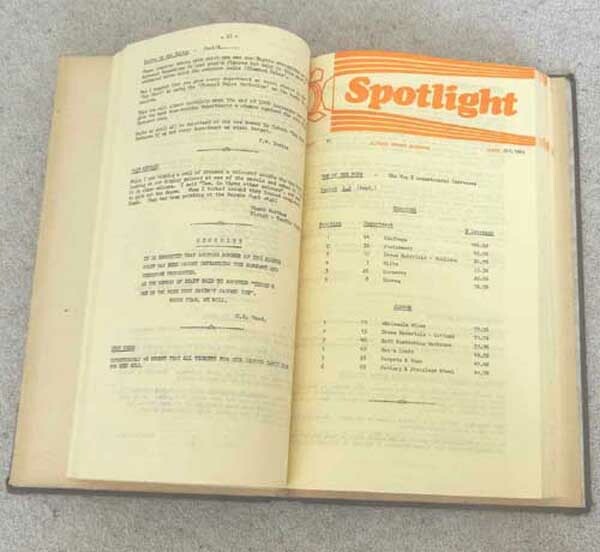 The staff magazine "Spotlight" provides a monthly review of sales activities, plus an opportunity of expression by would-be contributors on the payroll at either branch. Social activities are encouraged and organised for those desirous of using these facilities, while a Personnel Officer is always available to help and advise those emplyees with problems. A staff canteen can best be described as a cosy retreat for all those in whom an appreciation of a good "cuppa" at a reasonable price exists, and holiday arrangements are liberal, while cases of hardship or illness are given understanding and consideration. The Winter of 1969 was a disaster in terms of absenteeism as a result of a most virulent epedemic of influenza sweeping the country, with an an estimated 85% of total staff absent at some time during the term its activity. Strategic placing of a sadly depleted staff enabled the firm to maintain an efficient service, and the personnel on whom the burden of extra work descended responded nobly during the enforced absence of stricken colleagues. To illustrate the relations that have existed between Staff and Management since those far off days in the '20's', it is only necessary to quote from staff records. Many of the present staff have been in Suters emply for a considerable number of years, while to a few goes the distinction of having been with the firm almost since its inception.Good relations between Management and Staff are vital to the sucess of every business, and to achieve the perfect balance of this relationship I commend the following observations to both factions as a means of implementing the desired results. Firstly, Management should endeavour to maintain a wage structure comparable to rival standards, eliminate those petty inconveniences so freequently a cause for discontent among what could be a happy and harmonious staff, and to be aware of the need to make every employee feel they are an integral part of the machine. Three basic principles on which more than one commercial empire has been built. Any firm conforming to these simple precepts is assured of good relations during their observance, while the disregard of them can be tantamount to embracing demands for wage parity with employees' counterparts in rival concerns, incessant complaints arising from restrictions and petty inconveniences, imposed by neglect for the welfare of staff. Lastly , the nursed grievance of an emplyee who feels slighted or snubbed, by the failure of those who should set an example by an acknowledgement of participation, instead of a determined and continued attitude of isolation. The rebuff being of a nebulous character, the grievance remains unvoiced, though the impications conceived by such pointed ostracism are manifold, and a consequent seed of unrest is sown. Apples turn rotten when bruised, and a the smile should not be ignored. As two sides are on every coin, so it is with Management and Staff; a code of behaviour is therefore essential from those who constitute the means by which a business survives. The obligations I envisage as being paramount importance in order of execution on the part of any employee, are firstly, an absolute dedication to one's allotted tasks, however distasteful they might be, an ability to show alterness at all times when the possiblity of furthering an employer's interests arise, and finally, an unswervig loyality that by word or deed one does not betray. The complete fulfilment of these obligations to an employer is not the "open Sesame" to material gratification, though satisfaction in the knowledge that a job has been well done can even in these days be still a sufficient reward. To those of us who have fallen by the wayside in our efforts to carry out the suggestions outlined, I can only echo a few words of the popular ballad; "Pick yourself up, dust yourself off, start all over again". I have deliberately refrained from throwing bouquets to any specific colleague, thus obviating the necessity of defending myself against a charge of bias. However, let it be sufficiently ego inflating to everyone that I am sincere in my appreciation of the priviledge and pleasure it gives me to be associated with so many good companions. In conclusion, should any readers feel that I have been too liberal with praise and too emperate with criticism, may I commend to them a maxim running thus; "Bite not the habd that feeds ye". Even though I am condemned by circumstances to spen the waking hours within the confines of a "prison without bars", I am imune from the torture most would endure in similar plight. I can only hope that, having taken the plunge in revealing my identity, I shall not be fallen upon by furious colleagues at having inflicted the ultimate indignity on them, a foisting of the written word in their magazine. Should any reader have braved the foregoing diatribe until reaching these words, I offer my sincere thanks for displaying a patience and fortitude that literally gives me a real and lasting "LIFT" to my deflated ago. Another contribution from Mr Grove "Service to Suters - July 1970"